Or maybe, in this case, it is the other way around. You fans of horror (you are fans of horror, right?!?) may recall the story of the birth of one of the best horror novels of all time–Mary Shelly’s Frankenstein. Lord Byron, Percy Bysshe Shelley, and Mary Wollstonecraft (Shelley) were reading ghost stories aloud to one another one stormy night at Byron’s lake house in Geneva, Switzerland. Byron prompted his partygoers to write a ghostly tale of their own. Out of this came the beginnings of Frankenstein, a Modern Prometheus. 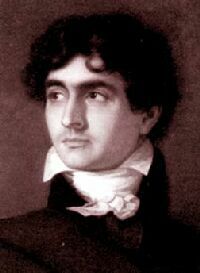 As it happened, John William Polidori was also there that fated night. Personal physician to Lord Byron and a writer as a past time, Polidori crafted The Vampyre, A Tale from a sketch of a story that Byron composed that same evening. Often wrongly advertised as a story by Byron himself, The Vampyre has remained a relatively obscure tale of terror. The first vampire story published in English, Polidori’s work predates the seminal Bram Stoker’s Dracula by more than seventy years. Check it out here, at the Amazon kindle store. Available soon in multiple formats for any digital reader of your choosing. This book is part of the Magical Creatures, A Weiser Books Collection that I am delighted to be curating. There are four more available now as well as five titles in the Paranormal Parlor collection! All curated by me, Varla. That’s right, I’ve been combing through the cobwebs to find you volumes of forgotten lore! John Polidori, Lord Byron's doc! This entry was tagged Bela Lugosi, books, Bram Stoker, Dracula, Frankenstein, Mary Shelley, Monster, Polidori, Vampire. Bookmark the permalink.